Donald A. Norman’s The Design of Everyday Things frequently pops up on lists of “must read” design books, but I’ve somehow managed to avoid reading it until now. I finally included the book in my last Amazon order, and now I wish I hadn’t waited so long to get my hands on a copy, because it really is a classic that deserves all the praise that’s been heaped on it. A big part of what makes The Design of Everyday Things so enjoyable are the descriptions of flawed designs that Norman peppers throughout the book. These case studies serve to illustrate both how difficult it is to design something well, and how essential good design is to our lives. Norman draws on his own (often humorous) experiences with poorly designed objects, as well as anecdotes from colleagues and friends, and paints an all-too-familiar picture of design gone awry. If you’ve ever struggled to program a VCR, pulled a door handle when you were supposed to push, or been mystified by the taps in a public restroom, then you’ll be sure to relate to these encounters with bad design. 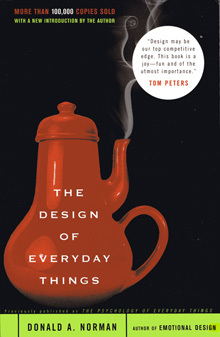 Norman uses the book’s examples of substandard design as a springboard for examining the factors that frequently derail the design process, and he proposes that matters can be improved when designers adopt a user-centered design philosophy and focus on the needs of the user. We found that to make something easy to use, match the number of controls to the number of functions and organize the panels according to function. To make something look like it is easy, minimize the number of controls. How can these conflicting requirements be met simultaneously? Hide the controls not being used at the moment. By using a panel on which only the relevant controls are visible, you minimize the appearance of complexity. By having a separate control for each function, you minimize complexity of use. It is possible to eat your cake and have it, too. Norman devotes a portion of a chapter called The Design Challenge to the discussion of computers, and while the technology he describes sounds antiquated to a modern audience – he has to explain to the reader what a computer mouse is – the interface design concepts he discusses still hold true today. Interestingly he singles out the Apple Macintosh, which had only been in the market a few of years at the time of the book’s publication, as an example of outstanding computer design and usability. His only complaint: the single button mouse. Over twenty years later Apple still set the benchmark for good design in the computer industry, and still draw criticism for the design of their mice! Would you like a pocket sized device that reminded you of each appointment and daily event? I am waiting for the day when portable computers become small enough that I can keep one with me at all times […] It has to have a full, standard typewriter keyboard and a reasonably large display […] And it should be easy to hook up to the telephone. Writing in 1988 Norman wasn’t able to guess that the computer and the phone would one day merge, but in other respects he was describing the modern smartphone. It’s that kind of insight that makes this book so valuable. Whether you design consumer goods, electronics, software, websites, technical documentation – anything, really – you’re bound to look at your craft in a new light after reading The Design of Everyday Things. This is surely a book that deserves a place on every designer’s bookshelf. At the start of the year I resolved to read more design and development related books, so I’ll be posting more book reviews here as I check each title off my reading list. If you want to see reviews and ratings for other books in my collection, check out my Goodreads profile. This review deserves to be titled “must read”!